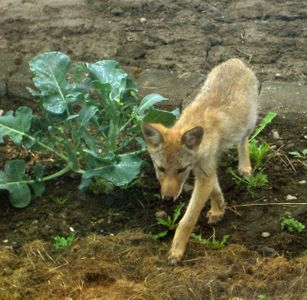 Strolling past the broccoli and only a few feet from her office window, coyote photo is by Anne Marie Gibson. Field mice and voles can be problems near wooded areas, fields or grassy lots. City gardens are not exempt either but common sense about cleaning up hiding spots under trash containers, old nursery pots, woodpiles etc. will go a long way towards reducing their population near your garden. Stalking cats, Terriers and snakes will also help keep the rodent population from increasing. I really didn't realize just how high the rodent population was until we finally moved onto the farm from the city house in the year 2000. Each summer we have a new pack of yearling coyotes that follow Bob on the tractor and pounce on the mice, shrews and voles that are unearthed. The youngster in the photo quietly trotted alongside the house to check out the grass clipping mulch around the veggies, he was just in the portion of field laying fallow (not planted) and was probably looking for more fat field mice. Although cute at this stage, the coyotes give our older cat panic attacks when they are so close to the house, and yes, he can still jump high enough to perch on top of the fridge when he sees them outside the window. In addition to the coyotes, there are two pairs of Ravens who check out the tractor on a regular basis. Generally, one bird will fly in to scoop up rodents and leave, then after a short time both birds are there to take away food to their babies. Turkey vultures and Bald Eagles have also been know to poke through the cut grass on warm sunny days, which adds greatly to the intrigue of bird watching in our little valley. We try to not leave boards and pots sitting around near the flower beds which keeps down the rodents near the house, but the tall grass is full of garter snakes that help in other ways, so I guess its either mice or snakes out here and I'm not fond of either by my feet. Nature has its way of providing balance - when the predator populations are up, the rodents are down; when they are causing noticeable trouble again, the big cats, coyotes, ravens are in a natural increase for a few years until food becomes scarce. Contrary to popular belief, moles do not eat lily bulbs, but if the underground bulb is "in their way", they will tunnel around or even through it, giving mice shrews and voles easy eating. Gophers will eat lily bulbs (and just about everything else underground). The best defense is a physical barrier of galvanized hardware cloth baskets surrounding the lilies, dahlias and other delectable bulbs and tubers.